The city of Salavan (ສາລະວັນ) is the capital of the Salavan Province in southern Laos. Located 125 km away, from Pakse on a partially paved road, it is located in one of the most isolated parts of Laos. Salavan is located in the southernmost area of Laos, one of the most isolated regions of the country. The city is located in a dense jungle area that has seen little development outside the city. Dozens of minority villages of various tribes are located around Salavan. Salavan's local culture is influenced by the Lao Loum, lowland Lao who form the majority of the population of both the city and country, as well as hilltribe and former colonial French cultures. Salavan is starting to become a popular backpacking destination for tourists in Indochina and has a "frontier town" like feel because of the scarce amount of settlements outside the city. Salavan is known for its version of Lao dance, which has spread to throughout the entire nation. 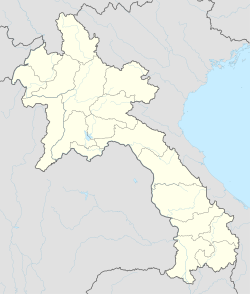 The Lao language is the most spoken language in the city. French is also spoken a minority, a legacy of the French colonial rule. ^ a b c "Salavan Travel Guide". Retrieved 2010-11-10.